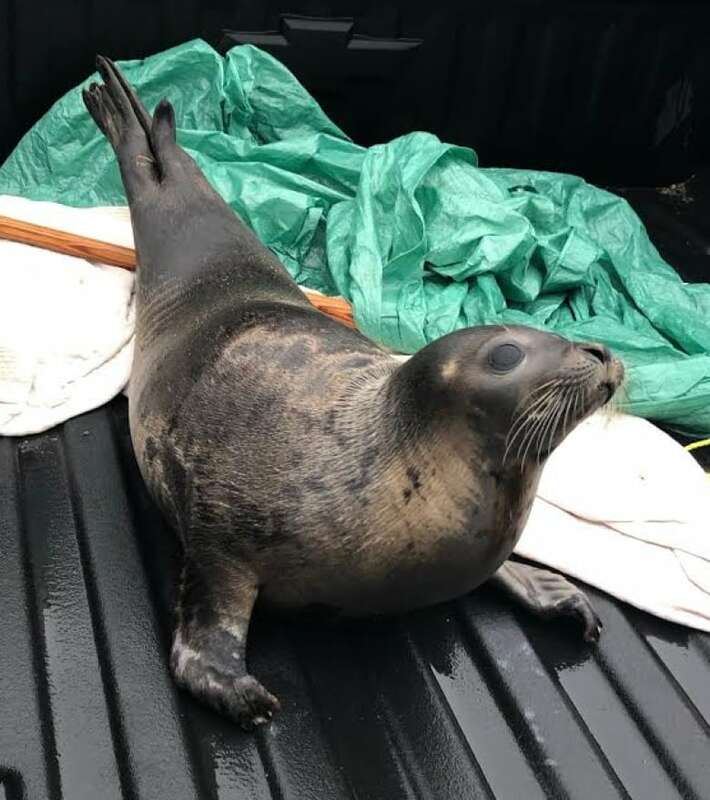 A group of seals continues to make its temporary home in a Northern Peninsula town, while Fisheries officers decide how to handle the situation. 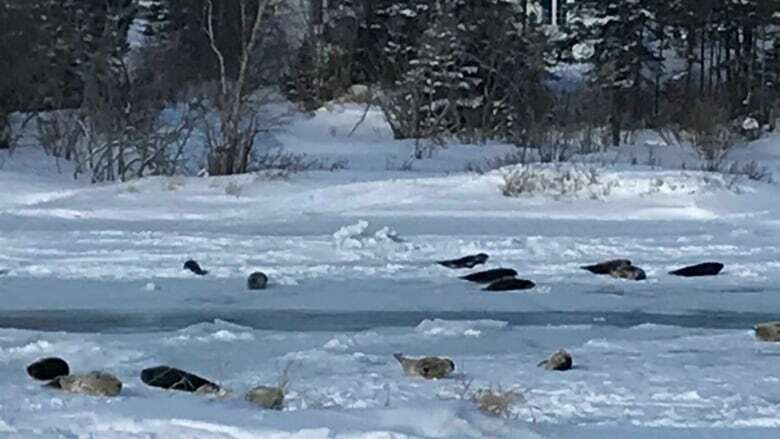 The seal saga on the Northern Peninsula continues, with an estimated 40 seals remaining in and around Roddickton and Department of Fisheries and Oceans officers in town trying decide on the best plan of action. 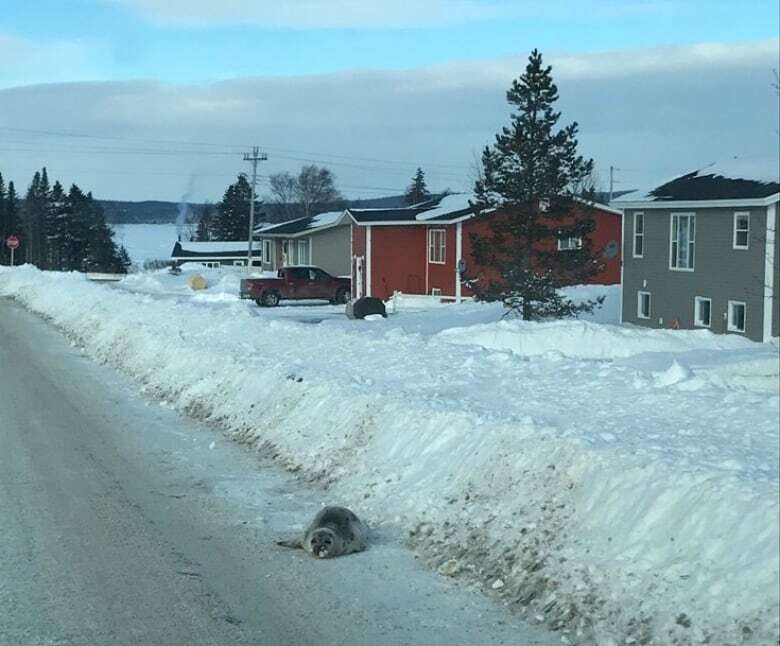 "They've been residents here now for one full week and it looks like they're not going anywhere real fast," Sheila Fitzgerald, mayor of Roddickton-Bide Arm, told CBC's Newfoundland Morning about the harp seals that are not only hanging out in two open brooks in town but wiggling their way up into yards and onto roads. "We've seen them in people's backyards, people's driveways, along the sides of the roads, in the doorways and entryways to local businesses, parking lots," Fitzgerald said. But along with the eventual plan for the seals, the total number of animals in and around Roddickton is still unclear, said Lloyd Slaney, DFO's director of conservation and protection in N.L. Recent reports from people in the area indicate that the number of seals may be lower than believed, Slaney said, closer to 20 or even fewer. Fisheries officers were expected to return to the area Thursday, he said, but were delayed because of poor weather across Newfoundland. "We'll be back in the community when the weather improves," he said. What is unusual about the situation is not that the seals are staying in the area, Slaney said, but that they are stuck due to ice that goes quite a distance out into the ocean. "The fact that these are stuck behind such a body of ice is a bit unique, I would suggest," he said of the seals. Harp seals migrate south in groups at this time of year, Garry Stenson, head of the DFO's marine mammals section, told The St. John's Morning Show. A group of 40 of the animals travelling together is not unusual, Stenson said — he's seen groups with as few as six seals and as many as a thousand. It is relatively unusual to find a group of that size on shore, he said, but not unheard of. "There's not a lot of ice off the northeast coast this year, so they've probably moved up the inlet looking to see what was there for food," he said. The seals likely found some small fish in the brook, and then when they went to leave found themselves stuck by ice that had frozen up after their arrival. Now that the seals are there, the town and the DFO have to decide what to do about them, and whether or not they should be — or can be — moved. Fisheries officers have been in town and are assessing the situation and investigating their options for the stranded seals, Stenson said. "They're looking around now to try and determine exactly how many seals are there, both in that area as well as in surrounding areas, and whereabouts they are," he said. That work will continue once the weather improves and officers can get back on the ground, Slaney said. Having the officers in town is a relief, Fitzgerald said, because they can respond much more quickly when a seal ends up by a home or business, or if one gets on a roadway. Previously, she said, an officer had to come in from the office in St. Anthony, 140 kilometres away. Seals on the town's roads are a particular concern, she said, after two were found dead yesterday. Stenson said both seals were struck by cars, something Fitzgerald said happened after several days of hearing about near misses from Roddickton residents. The town's roads are sanded now, to deal with ice and snow at this time of year, and the seals' light pelts blend in, she said — especially at dusk and dawn. "It's difficult for motorists, and nobody wants to see these little seals hit in our community." Stenson is reminding people to keep their distance. "We understand it is very tempting to interact with these animals, but a seal is a wild animal," he said. "It's kind of neat that Newfoundland is one of the few places where we're actually able to see these animals."